First download the current Java 8 SE Development Kit. Choose the Windows x64 edition and save it to a temporary folder on your server. 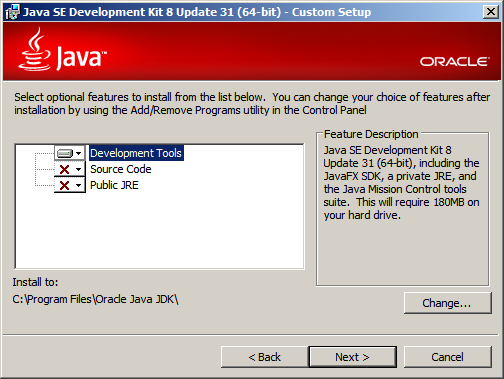 Create the folder C:\Program Files\Oracle Java JDK on your server. Start the installer by double-clicking the downloaded .exe file. Click Next. Select Development Tools and set the "Install to..." location to be the folder you created above. Untick Source Code and Public JRE. We don't need these. Use JDK_HOME as the name of the variable and the path C:\Program Files\Oracle Java JDK as the value. Finish by clicking OK until your are back at the control panel. It is important to keep Java updated with the latest security patches. To do so simply download the latest installer, Stop your Tomcat-Service and install the new version over the old one. Don't forget to re-start Tomcat after the update.